This vegetarian bean and barley chill can be made ahead and stored for up to three days in the refrigerator. It's a great lunch to take to the office. In a large saucepan, combine broth and bulgur. Bring to boiling; reduce heat. Cover and simmer about 15 minutes or until bulgur is tender. Remove from heat. Stir in sweet pepper, pesto, green onions, and balsamic vinegar. Stir in beans. Season with ground black pepper. Transfer to an airtight storage container. Cover and chill for up to 3 days. 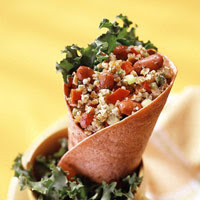 If desired, roll up in tortillas or serve on salad greens. Makes 4 cups. To cook dried beans, rinse 3/4 cup dried beans. In a large saucepan, combine rinsed beans and 5 cups water. Bring to boiling; reduce heat. Simmer, uncovered, for 2 minutes. Remove from heat. Cover and let stand for 1 hour. Drain; rinse beans and return to saucepan. Add 5 cups fresh water. Bring to boiling; reduce heat. Cover and simmer for 1-1/4 to 1-1/2 hours or until beans are tender; drain. Calories 333, Total Fat 11 g, Saturated Fat 2 g, Cholesterol 3 mg, Sodium 426 mg, Carbohydrate 47 g, Fiber 11 g, Protein 15 g. Daily Values: Vitamin A 0%, Vitamin C 0%, Calcium 0%, Iron 0%. Exchanges: Vegetable .5, Starch 3, Fat 1. This entry was posted on 4:00 AM and is filed under Diabetic . You can follow any responses to this entry through the RSS 2.0 feed. You can leave a response, or trackback from your own site.